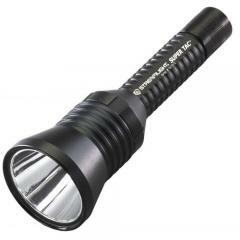 The Streamlight Super Tac XL LED flashlight is a powerful and versatile handheld illumination option that can also attach to a Model 69100 rail mount for use with a weapon. The high-output C4 LED can operate in three modes: a bright, long range beam, a less intense energy saving mode, and a strobe option for signalling or disorienting targets. Its deep-dish parabolic reflector produces a long-range beam with optimal peripheral illumination, while regulated electronics ensure consistent output through its battery life. The push-button tail switch makes it easy to cycle between the modes, and offers momentary and continuous one-handed activation. The casing is made from machined aircraft grade aluminum with a wear-resistant anodized finish, while the unbreakable polycarbonate lens is coated for scratch resistance. All openings are O-ring sealed to achieve IPX4 water resistance, and it has also been impact tested from two meters. It comes with a removable pocket clip for portability.